Rango (Johnny Depp) is a lizard in the middle of an existential crisis. Standing in his square glass tank --which acts as an abstract creative space--talking with inanimate objects, he begins acting and putting together a performance. He tells his plastic wind-up goldfish, his dead bug and headless doll that he needs an ironic twist of fate to project his protagonist into conflict. And at that exact moment, the car in which Rango resides swerves abruptly sending him and his tank flying out the back in a gorgeous slow-motion sequence and shattering on the highway leaving Rango more aware than ever of his isolation. It was at this moment I realized this animated feature from Nikeloedeon studios and director Gore Verbinski was truly something special and vastly different than the other animated movies out there right now, even from Pixar. 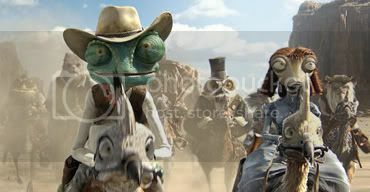 "Rango" is essentially a western, and a movie that is in love with westerns. Taking countless references and allusions from westerns of the past ("High Noon," "The Good, the Bad and the Ugly"), the movie uses these as inspiration to form a collective dreamscape of imagination, much like what rumbles around inside Rango's own mind. Rango--after a perilous trek through the desert--drops into a town called Dirt, the perfect location for the domesticated Hawaiian shirt-wearing lizard to reinvent himself just as he practiced in his tank playing out dramatic scenes and scenarios, except this one's for real. He calls himself a gunslinger and unwittingly becomes the sheriff and protector of the rundown Western town that is in the midst of a desperate water shortage. It makes sense the movie's visual consultant is Roger Deakins--who is most noted for filming the Coens' American west in "No Country for Old Men" and "True Grit"--because the movie is expertly crafted and astounding to look at (not to mention listen to with Hans Zimmer providing the score). The desert environment is bleak and eerie but not without some stunning scenery, especially when the sun is setting just right. The critters--Rango included--are rather grotesquely rendered whether they're scaly, slimy or hairy. It adds to the tactile feel of the movie's beautiful animation. The story (credited to John Logan and James Ward Byrkit with Verbinski) is weird, wacky and, for the most part, wildly unconventional and original. It reminded me of Verbinski's valiant effort in turning an amusement park ride into a movie with the first installment of the "Pirates of the Caribbean" franchise. There is a whimsical strangeness to Rango's adventure in the Old West with a vast array of birds, reptiles, amphibians, rodents and other unidentifiable animals populating the space. Half the time we can't really guess where the plot's headed which is a great thing considering the predictability that plagues kids' movies. There's a plucky romantic interest named Beans (Isla Fisher), a visionary and prophetic armadillo (Alfred Molina), a trio of mariachi owls narrating Rango's quest, the mayor of Dirt (Ned Beatty) who controls the town's water and may not have the civilians' best interest in mind, and there's even a voice cameo encapsulating the Spirit of the West which I can't spoil. This is among the great energy found in the voice cast. Others include Abigail Breslin, Ray Winstone and, lastly, Bill Nighy who provides the voice of a villainous rattlesnake. Within the story are politics on water and real estate in the Old West which turn out to be smart, sophisticated and vaguely allegorical. What's more, "Rango" is witty and thrilling, an animated romp embracing its own eccentricity with an unabashed enthusiasm for its story, characters and colorful palette all shot in--yeah, get this--glorious 2-D. Awesome review! I took husband and kids to see it, and ever since they have been driving me crazy for some Rango toys and dolls (the kids, of course). Do you happen to know where I could get my hands on some of those?? Thanks! I loved this film! So highly original and the animation was amazing. Great review, I agree with the rating.